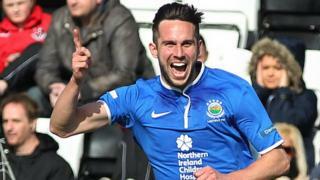 Andrew Waterworth scores two goals as Linfield beat Crusaders 3-2 at Seaview to remain one point behind leaders Cliftonville. Aaron Burns got the other goal for the Blues with Nathan Hanley and Timmy Adamson were on target for the Crues. Crusaders finished the match with just nine men following red cards for Paul Heatley and Chris Morrow.